I have loved Marvel Monster Comics since I was a wee, college-aged post-adolescent. These stories were first published in the late 1950's and early 60's in Atlas brand comic books like Tales to Astonish, Tales of Suspense, and Journey into Mystery. 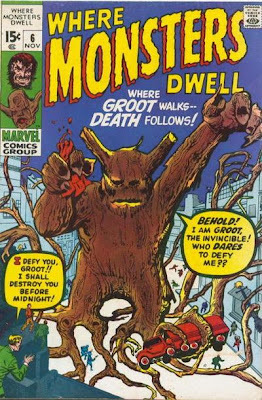 Beginning in the late 1960's, Marvel Comics began reprinting these stories in titles like Monsters on the Prowl, Creatures on the Loose, and Where Monsters Dwell, which is where I first encountered them. They're my favorite comics of all time. This is the second in a series of Spotlights on Atlas-Age Marvel Monsters. 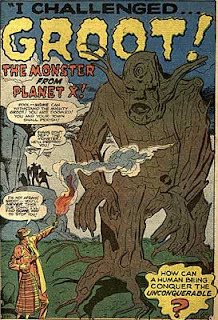 Perhaps the archetypal Kirby Monster Comic, "Groot, the Monster from Planet X," tells the uplifting tale of sad-sack biologist Leslie Evans, whose shrill wife Alice berates him at every turn for his "softness." As they drive home from a dinner engagement, she tells him she wishes he was more like partygoer George Carter, who is "so manly-- so rugged..." sighing, "If only you were more like that, Leslie!". On the road that night, they see a bright glowing object that crashes into a local forest-- but Alice is tired, and urges him not to investigate it. Then the next day she notices that their neighbor's fence is missing! Must be some kind of a prank, muses Leslie, but he soon decides better, and goes out to check the forest where the glowing object landed... (though not before getting henpecked even further by the shrewlike Alice). Sure enough, there he finds "Groot,"* a giant tree-like monster, who is busy eating up all the wooden objects he can get his roots on: barrels, clocks, brooms -- and even a doghouse! 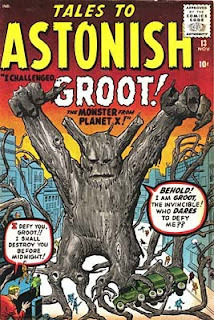 As Groot eats, his fiendish power grows, and soon enough Leslie returns with the cops, who hear the monster's ominous plan for them: Using the power of Wood Control, Groot will cause the neighborhood trees to surround the town and grow their roots rapidly into a net beneath the earth. This will allow him to lift the entire city skyward, through outer space, to his home on Planet X, where the hapless humans will be subjected to unsavory scientific experiments! Bullets are fired, but to no avail; even flames cannot harm Groot's powerful trunk! As the frightened townspeople look on, Leslie makes a bold and public oath to bring Groot down and save his city. Returning to his lab he works deep into the night. Finally, under cover of darkness, he arrives back on the scene with several small boxes that he opens near Groot's rootlike feet... and... within a few hours the mighty Groot has fallen! How did Mr. L. do it, you ask? SPOILER: Why, specially bred termites, of course: the only thing on Earth that could conquer the Unconquerable power of Groot! Then, in perhaps the greatest comic book ending of all time, the now-humbled, boy-am-I-glad-to-see-you Alice folds hero Leslie in her lithe, feminine arms, and murmurs, "Oh, darling, forgive me! I've been such a fool! I'll never complain about you again! Never!!" Doesn't get any sweeter than that. *Not to be confused with Grottu, King of the Insects (Strange Tales 73--2/60, and WMD 3--3/70) or Gruto, the Creature from Nowhere (Journey Into Mystery 67--4/61, and WMD 11--9/71). "I Challenged Groot... the Monster from Planet X!" Images from the great Monster Blog and the Grand Comics Database, with a tip of the hat to. More nerdlike info on Groot. Whoa! There were two different covers?? Tales to Astonish is the original release from the '60s, Where Monsters Dwell is the 1970's version. Usually the '70s covers were merely recolored, but sometimes they were partially/wholly redrawn as well. I love the originals, but the '70s covers often have a 'zing' to them that I find really exciting. What a great blog! I owned the 1960 magazine and never forgot Groot, all these years later. The Hulk annual was recently reprinted in Essential Incredible Hulk Vol 5.